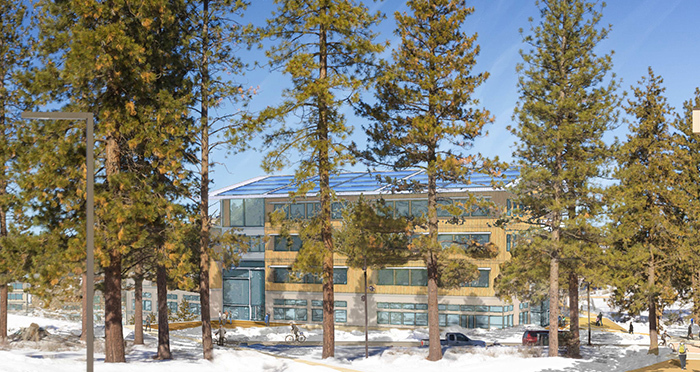 Supporters of the expansion of Oregon State University – Cascades have contributed more than $10 million in private gifts, exceeding the philanthropic match required for state bonding for the next academic building on the Bend campus. Launched in early 2017, the fundraising effort was the largest in OSU-Cascades’ history. It was propelled by a lead gift of $5 million from an anonymous donor. The gift was contingent upon the university successfully raising the balance of the $10 million required match, motivating others to contribute. The campaign closed with a recent and anonymous gift of $700,000. Donations also included a $1 million gift from the Tykeson Family Foundation and a $1 million gift from Charles McGrath, founder and president of Grace-Bio Labs of Bend. They also included a $500,000 gift from the Bend Foundation, as well as gifts from many alumni and community members. “A commitment to OSU-Cascades and its vision for a thriving teaching and research university is a commitment to generations of future Central Oregonians,” said McGrath. The business leader and philanthropist is a proponent of research and education in the bioscience fields. The gifts, along with $39 million in bonding approved by the Oregon State Legislature during the recent legislative session, will fund a state-of-the-art building focused on the STEAM disciplines of science, technology, engineering, arts and math.